You need to find the best laptop bags for men because your laptop is your life and you’re still carrying around your tired bag from college. Let’s get you into something a little more grown-up, ok? We’ve put together a list of our favorite laptop bags for men and answered a few questions you might have about how to choose the best one. Before getting into the extensive analysis and review of each individual laptop bag for men, here’s a quick summary table of the bags reviewed. How Do I Choose The Best Laptop Bags For Men? The best laptop bags for men have a few characteristics in common. Your choices will depend on your individual circumstances. Here are a few things to consider. Laptop bags for men come in a few different styles. Consider how and where you work before choosing a bag so that your bag matches your lifestyle. Classic laptop bags for men are messenger styles with a single large flap and a cushioned interior. 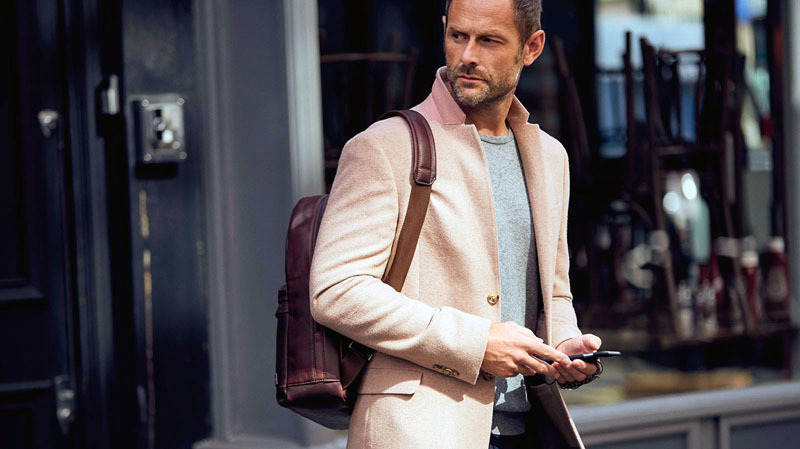 The best laptop bags for men have least one large pocket that should be reinforced with padding and other protections to keep your laptop from taking any impact as you carry it around throughout the day. A variation on this is the briefcase style with a similar construction on the interior but a handle instead of a strap. These are the best all-purpose bags. A sleeve is a minimal alternative. It’s a single cover with a large zip. Your laptop fits inside and closes up snugly. Sleeves are great if you change bags frequently or you already have a bag you love, but it doesn’t have a dedicated laptop pocket. They can also carry your laptop into different rooms at work if your work spaces change frequently. Laptop bags for men can also be rolling bags that resemble something more like suitcases. These might be overkill for the average office worker, but if you travel frequently, they’re perfect. There’s plenty of other padded storage for sensitive equipment such as presentation projectors or laptop peripherals. They also act as a carry on if you travel frequently. Backpack style laptop bags for men are excellent for public transportation commuters or bike riders. Backpacks prevent fatigue by distributing weight evenly across your back, shoulders, and hips. They have the same padding on the inside but keep your hands free for other tasks like steering a bike and catching closing train doors. Laptop bags for men need to securely store and protect laptops; but even laptop sleeves often have at least one other pocket to help wrangle your stuff. Bigger laptop bags for men should have plenty of open and closable pockets. Writing utensil pockets are essential so that you can both find one and keep them from writing all over your stuff accidentally. Larger pockets can hold notebooks, folders, and relevant books. The best laptop bags for men have interior and exterior pockets. If you carry a wallet, other devices, and chargers, there should be space in the interior pockets to help keep your valuables safe. Exterior pockets are great for (non-valuable) things you need to access all the time. The size of laptop bags for men depends on the amount of storage you need. Less stuff day to day equals less bag. One thing you do need to remember is the size of your actual laptop. 15 inches used to be the standard size, but there’s a lot of variety now with individual laptop sizes. Laptops now vary between a small ten inches to nearly 17 inches. Your laptop bag or sleeve needs to fit your laptop snugly to minimize jostling and reduce impact damage if you accidentally drop the bag. Do you want to be a grown up? Get leather. Just kidding. The leather is a beautiful and classic material that ages well, but it isn’t the only game in town. If you’re hard on your bags, leather will hold up, but it might take a beating. If you spend a lot of time in awful weather (Seattle, we’re looking at you), you may want something that’s a little more water and weather resistant. Durable nylon is an excellent choice for the best laptop bags for men. It resists tears and punctures, is often water resistant and has reinforced seams that don’t leak. The materials wipe clean easily, and many of them can go straight into the washing machine. The best laptop bags for men can also be leather. Leather is an excellent choice for daily commuting out of the weather and when you need to upgrade your overall office look. Formal offices complement a leather bag nicely. Make sure you get reinforced seams and zippers. These are the weakest points of your bag, so you want something durable, and that won’t leak with a little bit of weather. Let’s take a look at some of our favorite laptop bags for men. Kroser’s laptop bag is an affordable briefcase style that’s water resistant and neutral colored. It’s a classic design with plenty of pockets including a hidden RFID pocket for sensitive cards and badges. It measures 16.5 inches by 12 inches by 5 inches. The durable canvas material blocks most weather-related moisture from the interior of the bag. It’s TSA friendly and has two separate compartments with plenty of pockets to organize all your stuff. There’s even a luggage belt on the back. The best part of this bag is the price tag. Some of the best laptop bags for men are affordable, and it’s one of the most affordable bags on the list despite all the features. Another of the best laptop bags for men is a very affordable messenger style bag with plenty of storage. It’s built for larger laptops. It’s shockproof with multiple pockets and compartments in addition to your padded laptop pocket. It’s water resistant with reinforced metal zippers. The seams are well made and won’t come apart at the first sign of wear. The minimal color scheme fits in well with a variety of office jobs. Plus, the compartment is expandable so you can use it as a duffle or full carryon when you’re traveling. It doesn’t fit smaller laptops very well. If you decide to use it with a smaller MacBook style laptop, we recommend a laptop sleeve to reduce the amount of wiggle room you have in the laptop compartment. CoolBell’s convertible laptop bag is a very stylish multi-tone bag with a lot of color options. It’s an ultra design oriented option for those of you whose offices and workplaces have a higher dress code standard. The best laptop bags for men should be functional. You can carry it in three different ways. First, it’s a briefcase style. Second, attach the shoulder strap for an instant duffle or messenger bag. Third, pull out the hidden back straps for an instant backpack. Pay close attention to the condition of the seams. The bag has a tendency to show wear around the strap seams earlier than usual for a comparable bag. Made for broad shouldered people. Looking for leather in this list of best laptop bags for men? DHK’s messenger bag is an affordable leather option for someone who wants a more classic look. It has a padded inner pocket for a larger sized laptop, and plenty of outer pockets to store various tools and items. The leather is vintage and has a broken-in feeling to it. The seaming is reinforced with high contrast threads. You can detach the shoulder straps to carry it as a briefcase. The materials are goat leather, which is very soft and pliable. It’s somewhat weather resistant, but be careful with moisture because it can cause discoloration. If you think the best laptop bags for men use different materials for contrast, you’re in luck. This one uses leather and high-density canvas for a classic look. It has a shockproof laptop compartment that fits laptops up to 14 inches, plus plenty of pockets and storage for other materials. It uses magnetic snaps for the large compartment and zippers for other pockets. There’s a smaller compartment in the front for your iPad mini and an A4 compartment in the back for standard paper and notebook sizes. Matein’s backpack is slim and ultra stylish. It’s made of polyester blended fabric, which is durable and easy to clean. It has a hidden back pocket for easy access to valuables for you but keeps them safe from thieves. It holds up to a 15-inch laptop. Some of the best laptop bags for men use modern tech. This one has a luggage strap for travel and a USB port access for secure phone or device charging. It doesn’t power itself, but it keeps you from having to dig through your bag to find your charger. The shoulder straps are padded and ergonomic to relieve fatigue. Samsonite is the king of the best laptop bags for men, and their laptop fold over is no disappointment. It’s made from a minimally treated cow leather that ages uniquely and beautifully. There’s a large, impact-resistant pocket that holds up to a 15-inch laptop. It has a removable compartment that stores your cell phone. The rest of the interior pockets neatly hold all your essentials and keep them organized. The rear compartment holds files and paper, so nothing gets bent. It has reinforced seams and antique brass hardware. The leather is durable and water resistant, though prolonged exposure to moisture can cause staining in the leather. You have the option of a black version with chrome hardware instead. Taygeer’s water-resistant laptop bag is a highly durable, classic messenger bag with plenty of pockets for all your things. It has a very slim profile but still manages three compartments for books and files. It’s expandable for when you have thicker books or need to stuff a change of clothes into the interior. It’s not going to give you much space as an overnight carryon, but if you mostly need a slim profile work bag, this one has everything that you need for day to day office activities. There are plenty of pockets to keep smaller materials organized. The outer material is waterproof, excellent for commuters on bikes or other outdoor conditions. The laptop backpack is another convenient, slim bag for commuters and travelers who need to keep their hands free. It has three main pockets plus smaller compartments for all your materials. It also has a built-in charging cable. You have to invest in the power pack separately, but it does make getting your charger a lot more convenient. The cover material is a nylon blend that’s very durable and water repellent. You can spot clean the outer material easily. Padded shoulder straps distribute weight evenly across your back to reduce fatigue, and the laptop pocket is reinforced to protect against impact. As an extra safety feature, it comes with a combination lock. It fits laptops up to 15 inches. If you carry a larger 17-inch laptop, you’ll need to consider other options. Brinch’s glorified laptop sleeve is an ultra sleek laptop bag with a few pockets and reinforced compartments. It’s impact resistant, lightweight, and has soft fabric on the inside to reduce scratches to your expensive devices. It has a top loading zipper, and it comes in different sizes for different laptops. It’s water resistant and comes in a few different colors. The cover material is Oxford canvas which is durable and scratch resistant. It doesn’t give you a lot of room if you travel or carry around a lot of stuff, but it does handle day to day carrying, especially if you use public transportation on your work or school commute and need a slimmer profile. The Kroser is the only bag with an RFID pocket, something increasingly more relevant with smart cards and identification. It set this bag apart from the others on the list. It’s also a reliable and durable bag with plenty of space for more than just your laptop. It’s certified TSA friendly, so you won’t worry when you’re traveling. The material resists scratches and water, and you can spot clean it if you need to. Though you might find laptop bags for men with other functions for more specific circumstances, this one is an excellent, all-purpose choice. We think you’ll be delighted with all you can do with this bag. What’s your work situation like? Do you carry your laptop with you everywhere or only in certain circumstances? Let us know in the comments below.